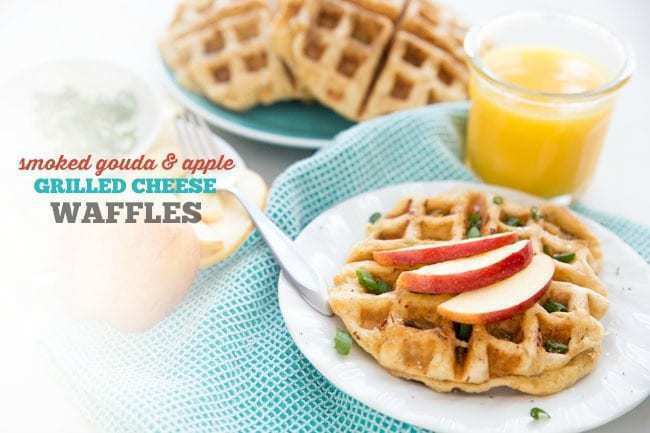 This sweet & savory combo stuffed into a simple waffle is perfect for snacking, breakfast, lunch, or dinner. Any time of day! And with only 3 ingredients, this comes together in no time! First thing’s first. Is it breakfast? Is it lunch? Dinner? What is going on with this waffley situation? Well you know what, I struggled with the same thing when I first made these. I knew they’d be insanely good (oh, and I was not wrong there! ), but once I made them, I wasn’t sure when I was supposed to eat them. And do I top them with something? Not syrup like a normal waffle. Maybe more cheese? Maybe chicken if you’re into that? They truly stand on their own as is. And the great thing is that you can eat them whenever you damn well please. 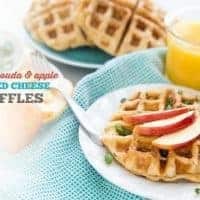 These stuffed waffles are a mashup of my favorite cheesy fondue that I love dipping apples into and super easy waffles. 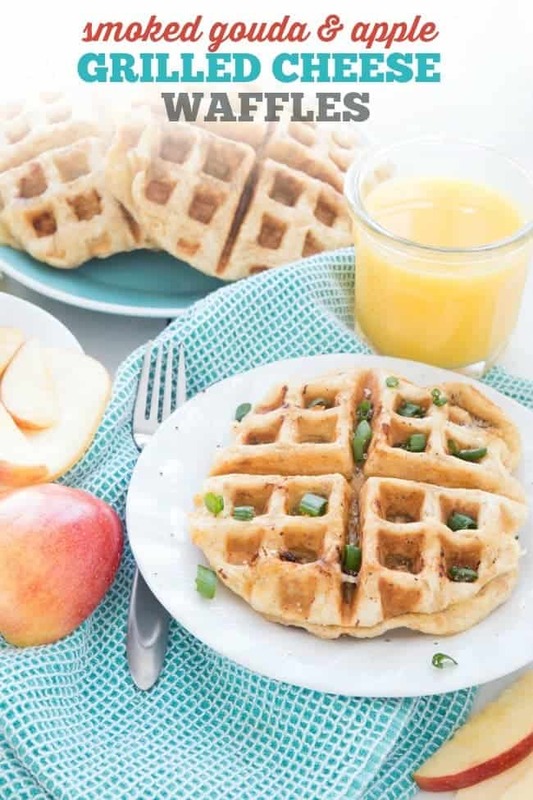 No need to make a waffle batter here. 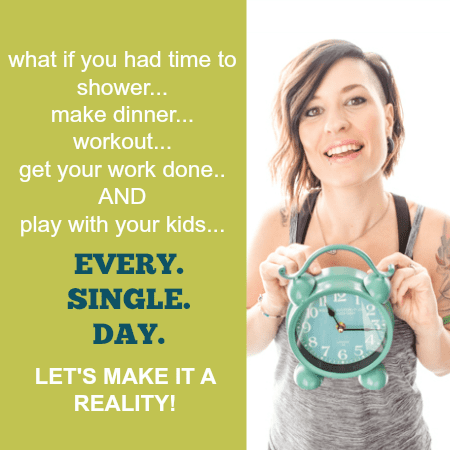 You really don’t even need a recipe (although I’m way grateful that you chose to check mine out!). 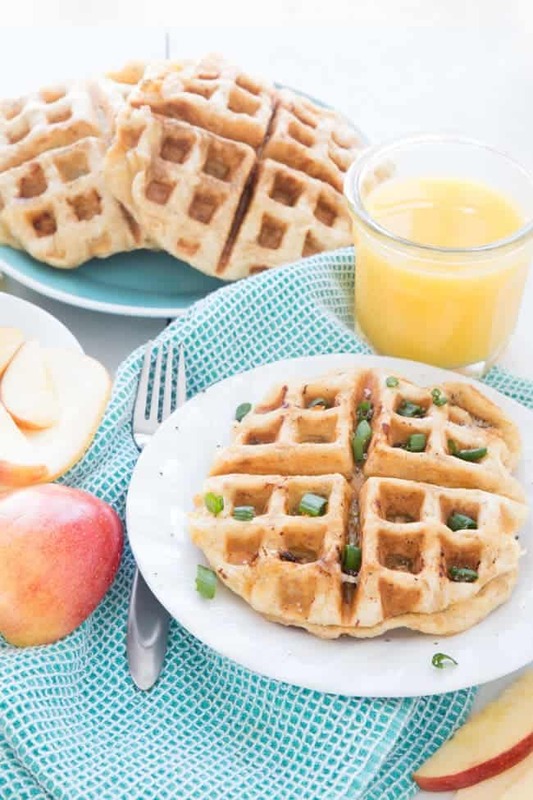 You just take a thawed ball of dough, slap it with some smokey cheese (that makes me not even miss bacon) and apple slices, top on another ball of dough and smash it up in the waffle iron. Truth is, you can just have them sitting around for the day to eat whenever your heart desires. Snack time. After-school. Dinner. Lunch. But I will tell you, they are THE BEST hot and right out of the waffle iron because heeellllllllooooooo melty stretchy cheese! 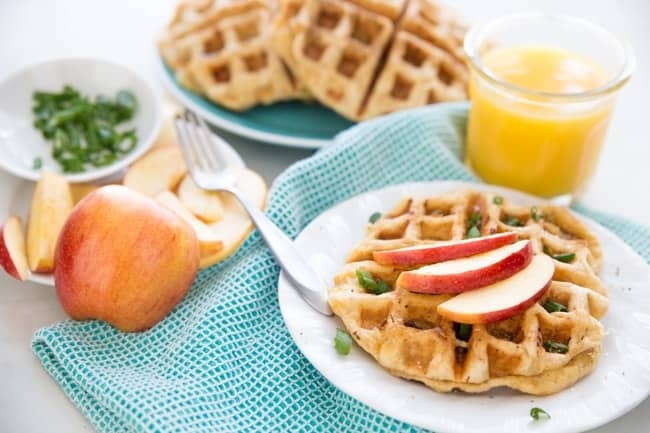 Turn on your waffle iron to preheat and spray with nonstick spray. Flatten each thawed roll dough to slightly larger than the size of your cheese slices. Top 6 of the rolls each with one slice cheese, 4-6 thinly sliced apple slices, and another slice of cheese. Top with the remaining 6 flattened dough rounds. Per the instructions of your waffle iron, cook each "assembled dough layer" until golden brown. Some of the cheese may ooze out, and that's completely fine. Try to clean it up the best as you can before cooking the next one. 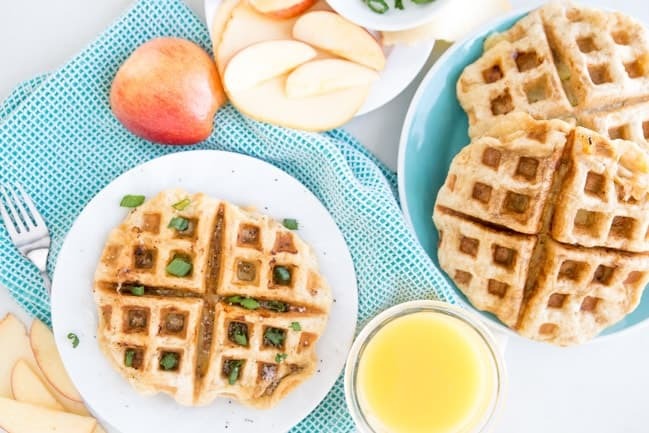 Looking for more waffle-type breakfast-y recipes? My pinterest board is full of them!